The latest CD from the Midwest Guitar Trio was released on 4/1/2014 from Spiritone Records. Entitled We Are All Connected, this CD features 8 new tracks written by Kenn Fox, as well as new trio arrangements of "Till Soon" and "The Soldier and the Princess" originally published on Kenn's earlier solo records. This project represents a new direction for both Midwest Guitar Trio and Kenn's writing. Recorded in it's entirety in Kenn's newly-built Anam studio. More info can be found at www.KennFox.com or on the album information page on the Spiritone site. The Midwest Guitar Trio [AKA Kenn Fox, Dave Karnes, and Richard McKay] have released their first CD titled All In Good Time. The CD features 11 instrumentals, most with Celtic undertones, and many written by Kenn. The sole vocal track, a swing version of the classic Stormy Weather features a guest appearance by Mare Edstrom. Mare Edstrom and Kenn Fox have released their long awaited Gospel Blues CD titled Way Beyond The Blue. This album has been in the making for over a year and features songs by Blues greats such as Gary Davis, Blind Willie Johnson, Charley Patton, and Mississippi Fred McDowell. Kenn has been added to the Lakewood Guitars site in Germany as an "Official Lakewood Artist." Paramount has just bought four guitars from the Lakewood Guitars booth at NAMM. We should have these in stock within a week or so and will be offering them at very special prices. Due in are: M14, A32cp,M32cp, and a J-32 Baritone. At the event, Kenn will be celebrating release of his new CD, Malakai's Rainbow, which features 13 new original compositions. Click here for more about the CD. Kenn has just completed new videos and released them on YouTube. "Till Soon" and "Harbor Sky" are both from the acclaimed Spiritone album, Sacred Wood, and tablature will soon be available for these. There are also new videos of two other, soon-to-be-released compositions, "Another Side of Sunday" and "The Old Wooden Bridge." Kenn's fingerstyle guitar composition "Ancient Eyes" has been selected for the Acoustic Guitar Forum No 3 compilation CD. This CD has just been released. Click here for information on how to obtain a copy. New Videos! Kenn has just released four new solo fingerstyle videos on YouTube. See the VIDEOS page. Kenn's new CD Worlds Collide is out! See the Spiritone Records Web site for details. "Wisconsin, in the heart of the American Midwest, may be best known for its cheese, but Kenn Fox could be about to change all of that. The folk and blues guitar instrumentalist has been an integral part of the Midwest folk scene for nearly 30 years, and in that time he's developed self-invented open tunings that give his music a very unique sound. Sacred Wood contains no surprises to those familiar with Fox's work; the songs are wonderfully played and introspective, with Fox consistently playing from his heart." by Paramount's own Andrew Edstrom is out! This all instrumental fusion extravaganza features Andrew's masterful electric guitar chops in a power trio setting on 11 original compositions. Although Andrew is a mere 15 years old, he is already being compared to guitar greats both past and present. Kenn handled all of the production and even put in an appearance on slide guitar. VIDEOS: Kenn has just finished 4 videos featuring fingerstyle compostions from his upcoming release Worlds Collide. These videos, as well as future videos, will be archived on the Paramount site. This will give our customers an up close, and more extensive look at guitars by many of our featured builders. Kenn's new CD, Sacred Wood, AVAILABLE NOW!! Kenn is currently working on a new album of fingerstyle material titled Sacred Wood, which will feature 14 new solo guitar compositions. The project is being recorded with guitars crafted by Dermot Mcilroy, David Webber, Josh House and John Quarry of Northwood. The package will include lots of detailed info on the instruments and full color photos. It looks to be a good time for Guitar connoisseurs! Kenn plans to make tablature available as well for some of these compositions. Watch the Paramount site for more info soon! Kenn has taken delivery of the first Webber Terz guitar. David has created a modern, steel -string, version of what was originally a nylon stringed, guitar tuned up a minor third [or 3 half steps] higher than normal. 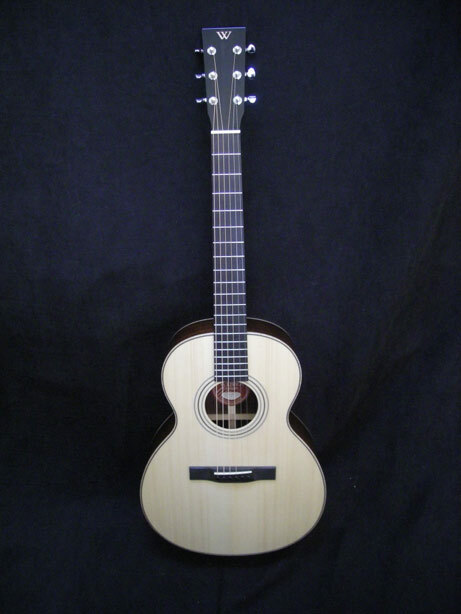 This guitar also features a 23.5" scale. This unique take on the guitar was prevalent during the nineteenth century in Austria and was used primarily for guitar ensembles. Kenn intends to explore the possibilities of it's use as a solo instrument. This fine instrument will be featured on his up-coming solo fingerstyle CD titled Sacred Wood currently being recorded at The Exchange in Milwaukee. Canadian Luthier Josh House and Paramount Guitars present "The Piedmont"
The spirit of Blind Blake and the science of modern luthiery come together to create the ultimate blues and ragtime guitar! Influenced by the legendary pre-war Gibson L-OO, yet built with an array of modern features, this guitar offers today's working blues player an incredible stage and recording tool. Built light and fast for percussive fingerstyle, it is easily capable of getting nasty in a swampy Delta setting. Dual soundports allow the player to hear his own playing "in stereo," in the moment. The elegant yet understated beauty of this instrument is monumental. 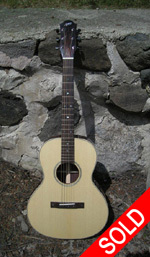 CLICK HERE for information about models and Specs for Josh House guitars, just posted! Wednesday seemed like any other day...The usual breakfast, a cup of steaming hot coffee, and the smell of fall in the air. FedEx showed up with an unexpected carton. 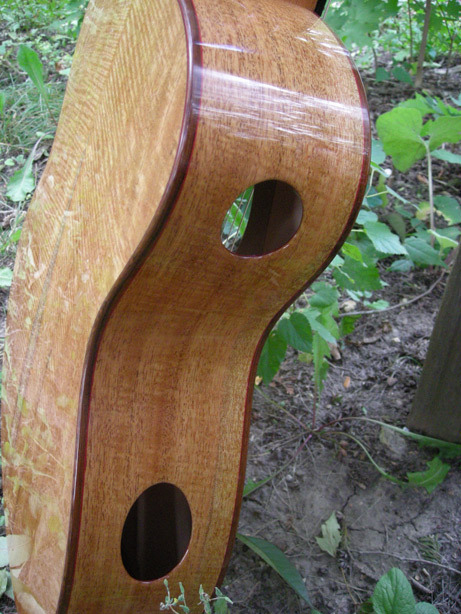 It was the first guitar from Ontario luthier, Josh House. Guitars come and go here on a daily basis, so the arrival of a new carton doesn’t usually excite me as much as it probably should. I’ve been following the progress of this guitar with photos for several months, and while it looked interesting, I really had no idea what I was in store for. Coffee in one hand, Exacto knife in the other, I cracked the carton and pulled out the tweed case from inside. As I popped open the lid on the case, I got a whiff of sweet nitrocellulose lacquer, something I haven’t experienced for awhile. Looking down at the guitar, the first thing I noticed was the unique balance of the details. This guitar displays lines that are simple, yet graceful. I set my coffee down, grabbed the guitar, and sat down to have a listen. Much to my surprise, the degree of complexity, warmth, and sheer volume of sound coming out of this guitar are like nothing I’ve ever heard. The guitar is built light as a feather, like all those wonderful old Gibsons and Martins that we all dream about; yet it is capable of producing a wealth of sound, both bold and beautiful, with a degree of responsiveness that I’ve always longed for. Chords blend like a great orchestra, and single notes jump out and seem to reverberate forever. Needless to say, I had to have it. Our first Josh House Grand Auditorium will hold an honored place in my personal collection. Josh House guitars will be available through Paramount in the upcoming months and, hopefully, years. I have placed orders for five guitars, and I strongly encourage everyone to check them out, because they are unlike anything we have ever heard. ALBUM NEWS 7/1/2007: The new Mare Edstrom Blues Band album, Sugar Sweet, has just been completed at The Exchange in Milwaukee. The new album features vintage R& B, Rockabilly, Gospel, and Country Blues with a very live feel. It has just been sent off to Airshow in Boulder for Mastering by David Glasser. The album is jam packed full of interesting guitar sounds, both acoustic and electric, by Paramount's own Kenn Fox. The project is also produced and arranged by Kenn Fox. See the CD's info page at Spiritone Records for more!